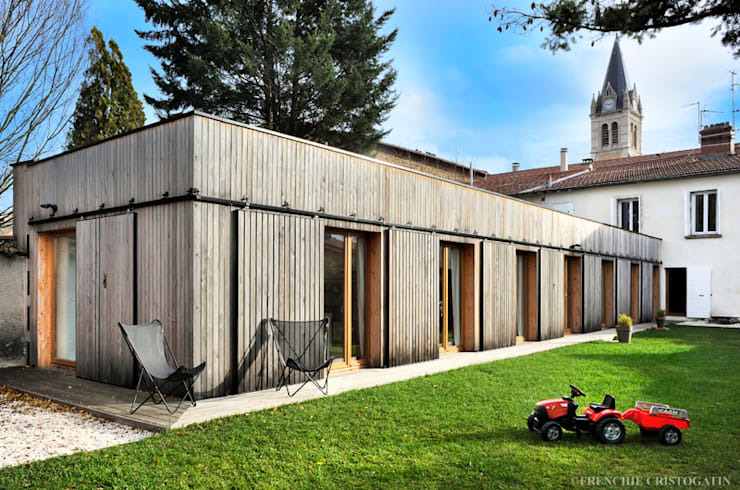 These cube-shaped homes are practical, functional and economical – no wonder, given that the cube is a fundamental, oft-used construction shape. 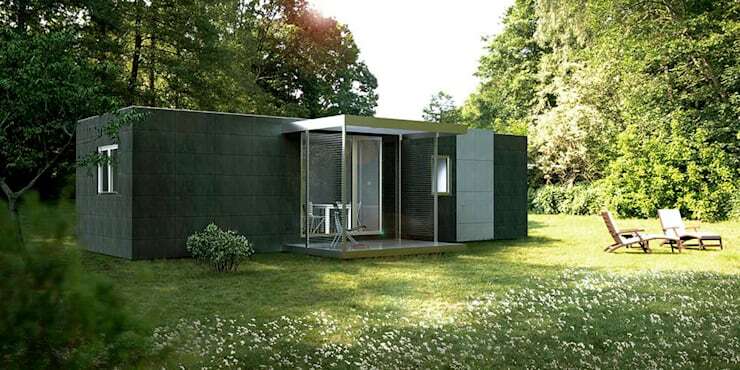 Many modular or prefabricated homes take on a particularly cube-like geometric shape, a design which makes it easy to deliver the parts of the home in concise modules and align them easily based on their even lines and right angles. Cube homes often take on a modern look, often seen in designs that emphasize a seamlessly flat roof and fiercely rectilinear nature. In these examples, you'll find cubic homes that range from eco-inspired cabins to luxuriously modern villas, each with their own unique style. Find home inspiration from these bold and beautiful cube-shaped homes! In the natural landscape, a wooden cube fits in perfectly! 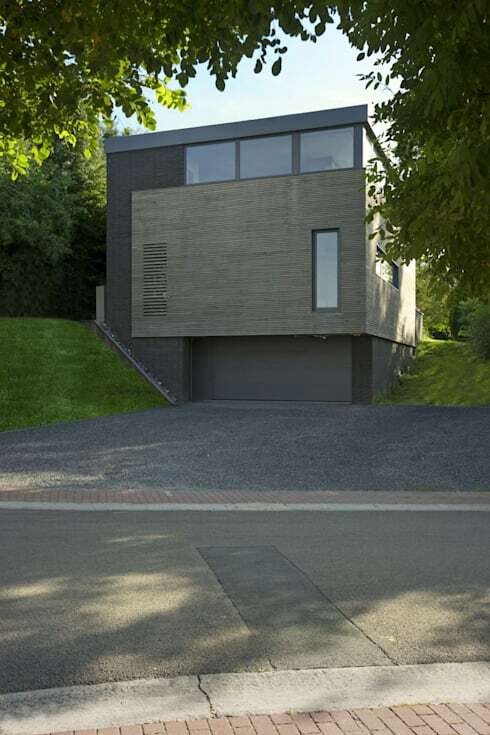 The concept for this house is closely linked to the environment. The architects built the home with a wooden exterior – an environmentally friendly choice – and ensured that the cube structure kept a low profile so as to disappear into the landscape, allowing the nearby hilly landscape to rise up above the home. The many openings in the facade offer residents the necessary view of the surroundings and let the light illuminate the interior. This house enjoys a view of the seaside from the heights of Carry-le-Roue in Southern France. This minimalist Mediterranean villa is comprised of various cubes that appear to interlock, making for a complex and balanced modern design. The various terraces formed by these interlocking pieces offer the residents the opportunity to relax in the warm sea breeze. This impressive two-story house is beautiful by day, but large illuminated windows make it absolutely stunning by night! This cube home is distinguished by large areas of opaque and transparent squares, thus creating a beautiful game between open and closed façade sections. Transparency was an important concept in the realization of this property, manifested in ample windows that give the home a welcoming, straightforward character. This simple box home has it all. An unusually dark green exterior allows this home to fit in well with a lush forest surrounding, supported by a solid wooden frame. With a small porch demarcating the center of the house, the home takes on a symmetrical, measured look that goes easy on the eyes. resident also get a connection with the environment. Built as a simple one-story home, this woodland cottage eliminates bells and whistles, instead placing importance on an immediate and intimate connection to nature. 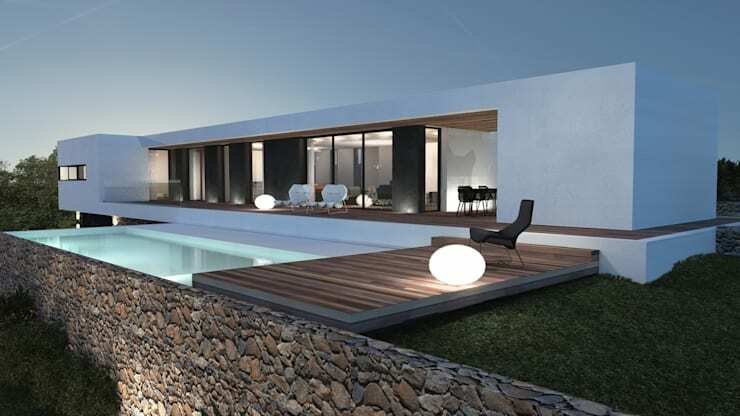 With a rustic field stone wall forming the base and an ultra-sleek white rectangle stretching along the top, this modern home in Spain makes a sweeping, chic appearance. The design of the main mass is minimalistic, with very few decorative furnishings or even structural elements (like gutters) visible. It's elongated shape is especially appropriate on this hillside, where the long home enjoys a broad panorama of the scenery below. 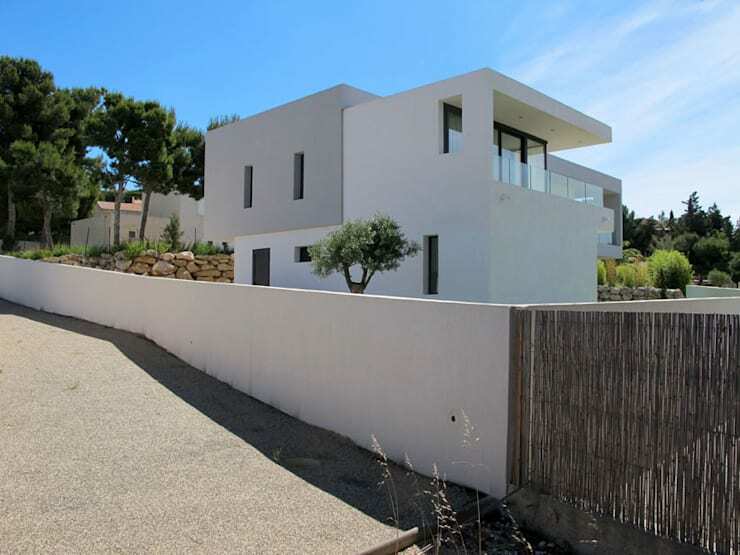 This polished holiday home may look high-end, but the architects built it for only 24,000 Euro! 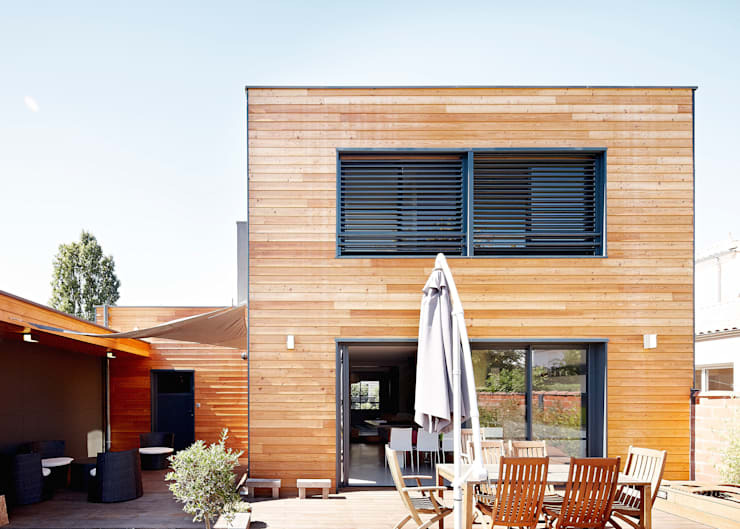 This example hails from Germany, where this country cube house creates its own little enclosed backyard. This U-shaped home creates a courtyard that's sheltered from the wind, and this case, they've topped it with a modern metallic pergola structure for growing vines in the summer. The house enjoys a view of the backyard pond and greenery through wide windows, whose blinds operate through a system of pulleys and counterweights. This country home is clearly designed to embrace the outdoors, relishing in its own little private slice of paradise. 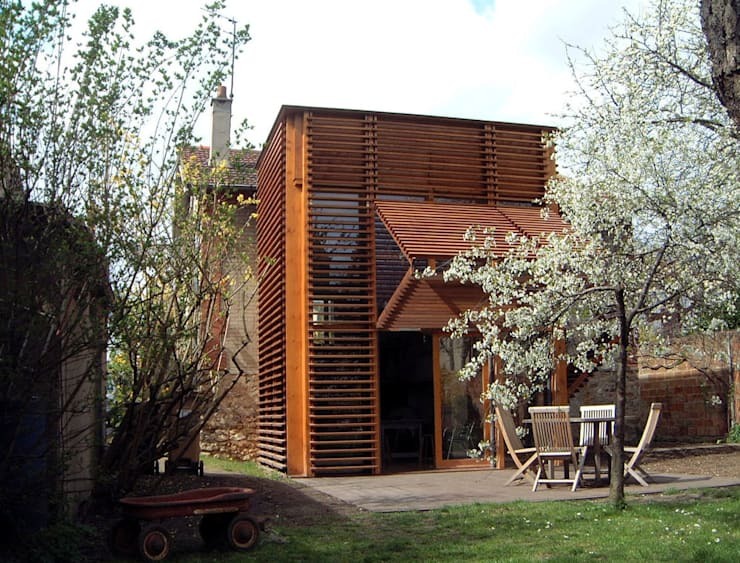 This wooden-clad home in Lyon, France has a unique shell of larch wood slats covering its facade, turning a modern cube structure full of glass windows into a more modest neighborhood home. The dark stain of the wood provides a rich complement for this natural backyard, and it also gives the residents privacy while maintaining openness on all sides. In addition, the dark caramel tone has been selected for its ability to blend in with more historic buildings near the home, including an old church. This old property scored a stylish expansion with the addition of this unique rectangular structure, which falls somewhere between modern and rustic. Note how the windows are covered on the outside with sliding panels similar to the ones found in a barn, and how the layout reflects that of stalls in a stable. While the architects have obviously chosen a modern form that doesn't conform to the traditional tiled roof and stucco walls of the other buildings on the site, they've opted for an expansion that maintains a low profile and adds a large amount of natural light. The house was built with the large terrace facing the South, enabling its residents to enjoy a full day in the sun. This home maximizes space with a simple structure comprised of two large wooden blocks that provide a large amount of open living space within. 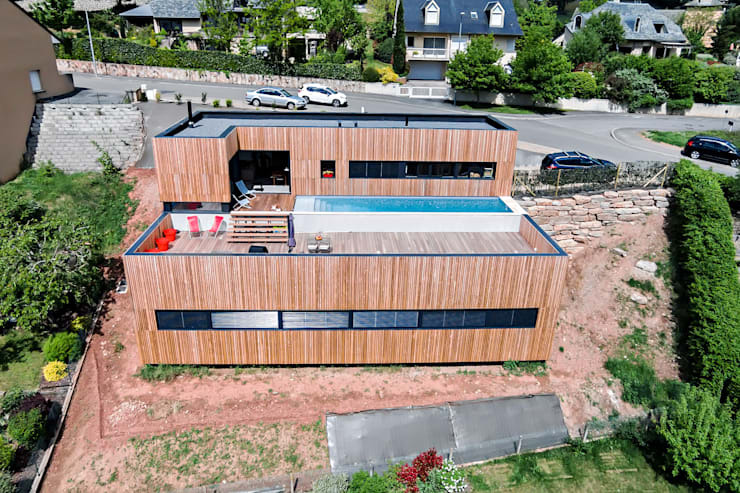 Light wooden panels on the outside give this glamorous and luxurious home an eco-centric touch, and the location on the hillside is sure to provide generous panoramic views from the poolside. This compact cube house and the road seem merge together as the smooth, grey surface of the roadway and driveway extends into the properties of the home. Located in the Hainaut province of Belgium, this home displays a subtler form of beauty with matte and muted colours – a sort of camouflage for blending in between the trees. Both floors of the home rest directly over a partially-below-ground garage, forming a single cube-shape mass that makes a simple statement of less is more . What's your take on these cube house styles? Comment about your favourite cube home!